The Hoste RestaurantIn addition to 62 bedrooms, all uniquely styled, The Hoste's historic bar, The Hoste Arms, dates back 400 years. There are also restaurants, a sheltered walled garden, fitness centre, Beauty Spa and luxury 20-seat cinema. 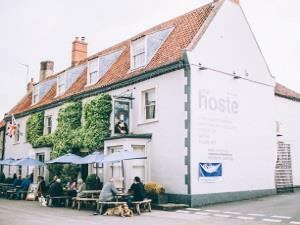 The Hoste was recognised as one of the leading ‘cool hotels’ by The Times in 2017 as well as one of the top 25 best food destinations in the UK. Guests can choose to dine in one of The Hoste's award-winning restaurants; the stylish Burnham Market Brasserie Restaurant and the fine dining Traditional Panelled Restaurant; or the conservatory and historic bar, open all day for casual dining and popular with dog owners. The experienced team of chefs have a dedication to style and quality which is applied to every element of the dining experience. Menus are changed frequently according to seasonal availability, taking advantage of local Norfolk produce on offer, such as Brancaster Oysters and Norfolk Venison. The Hoste is proud to have the new Remember Nelson Exhibition, featuring letters written by Horatio Nelson, together with prints and displays from artists including George Arnold and an original life mask of Lord Nelson cast in Vienna in 1800.Open daily from 10am to 5pm, the free exhibition showcases exhibits and artefacts about Nelson’s life, career, early life in Norfolk, famous battles and legacy which can be found in the Nelson Lodge, located in the Hoste’s walled garden. The exhibition is being run in partnership with the Nelson Museum in Great Yarmouth and it is expected to be the largest exhibition of Nelson artefacts in Norfolk, outside the Museum. It will run for a minimum of two years and includes pieces loaned from the National Maritime Museum in Greenwich and the Nelson Museum in Great Yarmouth. Born locally in Burnham Thorpe in 1758, Nelson frequented The Hoste – formerly the Pitt Arms – in his early years. Before being recalled to service in 1792, he is known to have stayed in Room 5; he would catch the morning coach to London from Burnham Market, as well as receiving his dispatch papers there. He also used the Pitt Arms as a recruiting post. Our hotel was named after another local seafarer Captain Sir William Hoste and the exhibition tells the story of William Hoste’s relationship with Nelson and how Nelson nurtured the young sailors who worked with him. Although Hoste’s story is not so well known, he’s another Norfolk hero to be proud of.‘A History of The Hoste’, a book celebrating The Hoste’s strong maritime connections and links with Lord Nelson is also available from The Hoste, price £10.